The panel setup is growing on me some...I'll give it some time & decide later on. Hopefully I'll be able to setup a tint appointment next weekend - so by the end of September - I'm hoping to have that taken care of. Wheels already showed up - I might wait awhile until I settle on tires & have them all installed. Not sure how it would look without being lowered some. I think up next I'll order the full length sub-frame connectors to tighten everything up! Last edited by Logan03CO; 09-07-2014 at 07:55 AM. Assembled December 4th, 2002 at the Dearborn, Michigan plant. 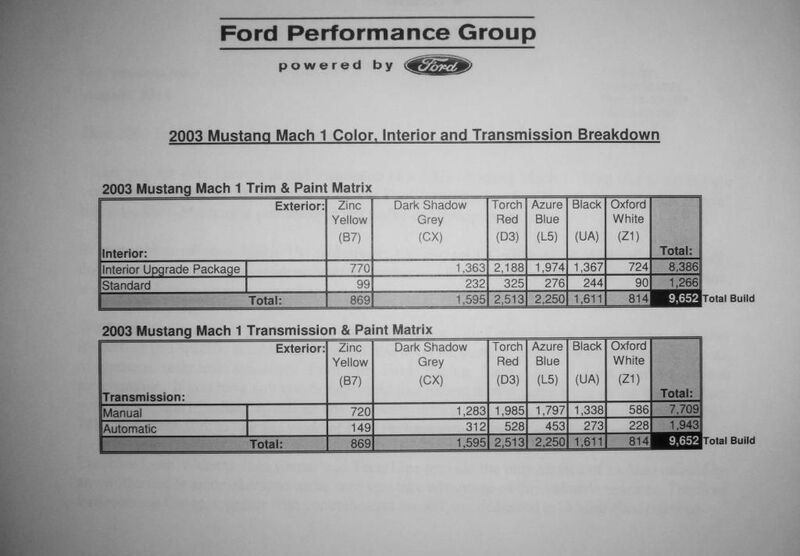 It has serial #684 of a build of 9,652 which is the total Mach 1's produced that year (all combinations). 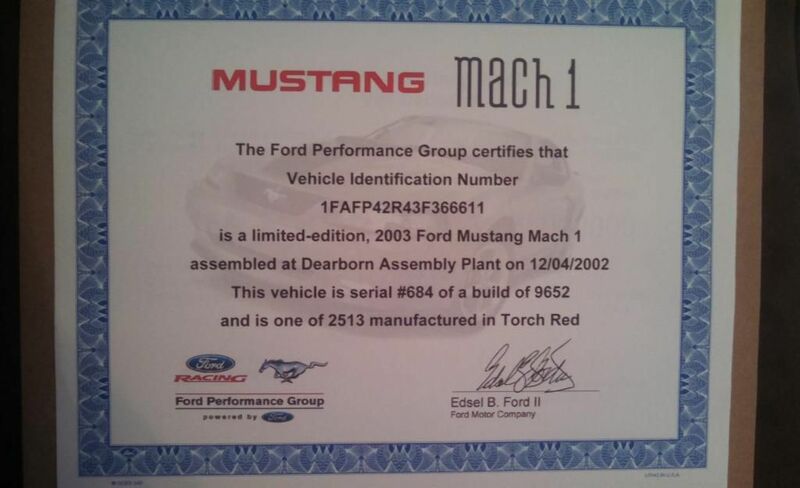 However, it's one of only 528 when it comes to an automatic Mach 1 produced in 2003 with the Torch Red color. Last edited by Logan03CO; 06-28-2016 at 03:01 AM. The main items I was after were the wiring diagram & complete workshop manual - but then I noticed I could get some of the 'original paperwork' (Portfolio & Owner’s Manual) so I added that stuff on just for the hell of it. Keep your thread, I like seeing the progress on your car. And, 2v for life! 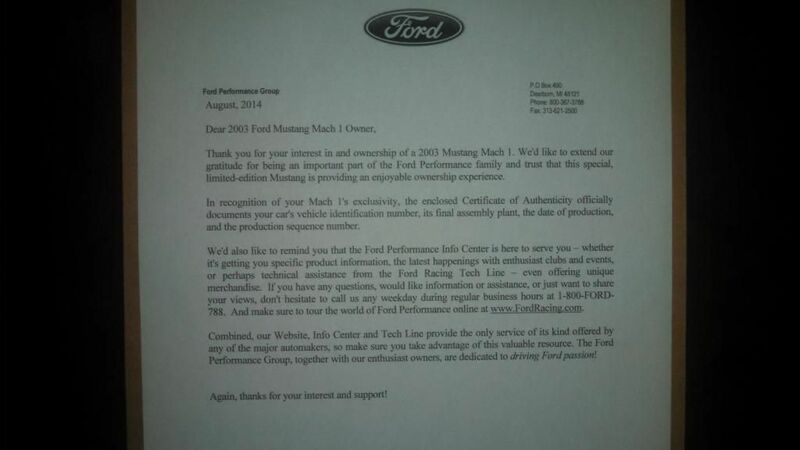 Screw 4v mustangs . X22222 and what does an oil separator do? Why not the raxium tail light kit? And idk about the smoked tail lights... It would look good on red but I would rather you got the MDD matte black tail light trim like me! !